The ‘Bristol Model’ for tackling FGM which focuses on community engagement and empowerment, strong partnership working and developing the right services and resources to tackle ‘FGM’ at a local level is lauded by some. But it did not involve the Somali community in Bristol despite that they make up the single largest migrant group in that city. Nor does it meet their approval. Reverberations from the high profile ‘FGM’ trial held in Bristol, UK, in February 2018 are still being felt throughout the city and county. A father of Somali origin was accused of an FGM-related child cruelty offence. Judge Julian Lambert described elements of the court case against the man, as “deeply troubling” and called the account of the key witness, an anti-FGM activist, “inconsistent”. The Judge had found the evidence “wholly inconclusive at the highest” and instructed the jury to return a non-guilty verdict. A police spokeswoman said afterwards that the force accepted the court’s findings but insisted, despite evidence to the contrary, that “FGM remains a deeply entrenched practice and we know these harmful procedures are happening in this country right now”. More recently the Police Commissioner asserted it was even happening within the boundaries of Avon and Somerset. The Bristol Somali Media Group while acknowledging that FGM is an illegal practice that should be eradicated, suggested it didn’t give activists and charities the right to waste public money and destroy the lives of innocent families in the process. 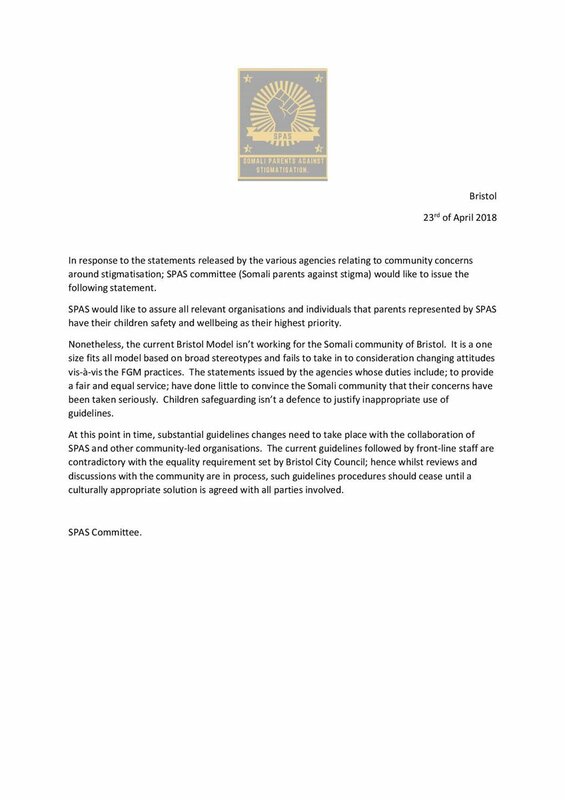 The Somali Community in Bristol whilst relieved at the court verdict, were upset and formed the ‘Somali Parents Against Stigmatisation Group‘. Members said the anti-FGM campaign in Bristol “is based on assumptions, misinformation and intimidation” which “targets and profiles certain ethnic groups”. The Group is also critical of Bristol’s much publicised FGM partnership model, suggesting it is detrimental to the welfare and safeguarding of young girls, and that the work of law reinforcement officers should take an ‘evidence-based’ approach. Speaking in response to FGM concerns raised by community groups, Sally Lewis, Independent Chair of the Bristol Safeguarding Children Board said: “The Bristol Safeguarding Children Board is proud to have supported the strategic response to ending Female Genital Mutilation (FGM) and of the strong relationships we have built along the way. Throughout our many years of work on the important issue of safeguarding children from FGM that includes contributing funding to the 2017 End FGM Summer Campaign and Community Feedback Event, the Bristol Safeguarding Children Board and its constituent partners have welcomed the positive and constructive engagement of Bristol community groups and individuals. Avon and Somerset Police and Crime Commissioner Sue Mountstevens said: “Members of the local Somali community will understandably be concerned by the experiences shared at the recent Somali Parents against Stigmatisation community meeting. 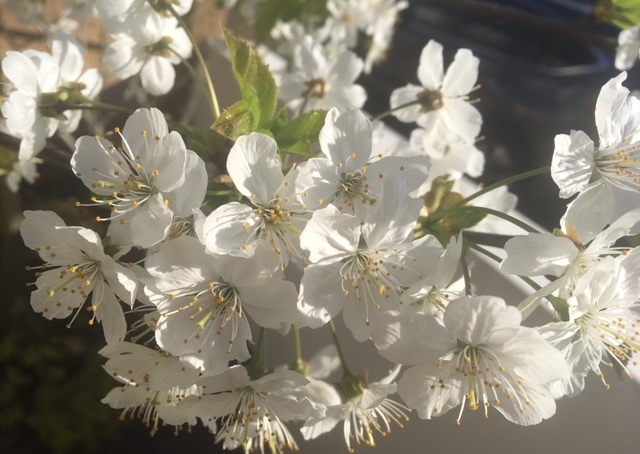 “I am fully aware of local people’s feelings within the community towards the police and social care, particularly regarding female genital mutilation. These feelings were reiterated to me when I recently met with members of the Bristol Somali Forum at one of my local public drop-ins following the Bristol trial. “It’s important our local communities have trust and confidence in the people who are there to help them when they need it. Any response from the police or social care should be proportionate and free from judgment or prejudice. However, it is only right the police and our partners take any reports of FGM seriously, as they would any form of child abuse. “There is some fantastic work taking place across Bristol to tackle FGM and I am very supportive of this. We know FGM is happening across Avon and Somerset but let’s be clear, FGM is and must not be aligned to a particular community. We all have the welfare of our young people at heart and I hope together we can change perceptions and tackle this crime. Jacqui Jensen, Executive Director of Adults, Children and Education for Bristol City Council said: “Safeguarding the health and wellbeing of children and families is an important priority for our social workers and the Council. We have worked for many years to develop policy and practice to keep children from harm and we understand that despite our best intentions the actions we take will not always be popular. This is why we work with our partner agencies and the Bristol Safeguarding Children Board to constantly evolve those practices and policies to meet the needs of children, families and communities. “Following recent meetings with communities affected by FGM we have listened to the feedback received and the concerns raised by community representatives. As a result of these discussions we are updating the guidance given to social workers to ensure that where proactive action is required, their engagement with children and families about FGM is a sensitive and positive one. “The safety of children across Bristol, North Somerset and South Gloucestershire is the priority for all partners involved and we will continue to engage with and work with all communities on this sensitive issue,” said Anne Morris, Director of Nursing at Bristol, North Somerset and South Gloucestershire Clinical Commissioning Group (BNSSG). Superintendent Andy Bennett said: “We are proud to have played a key role in the response both locally and nationally to raise awareness of, and to prevent, FGM. Bristol’s Somali Parents Against Stigmatisation group expect to consider these response at their meeting on Tuesday 8 May. PS. They have issued this statement in response to the agencies’.